Sonny Dickson has done it yet again! This Australian teen who has strongly built a huge following by leaking pictures of upcoming Apple Inc products, this time flaunts the purported fingerprint scanner of the latest iPhone just before it expected release next week. 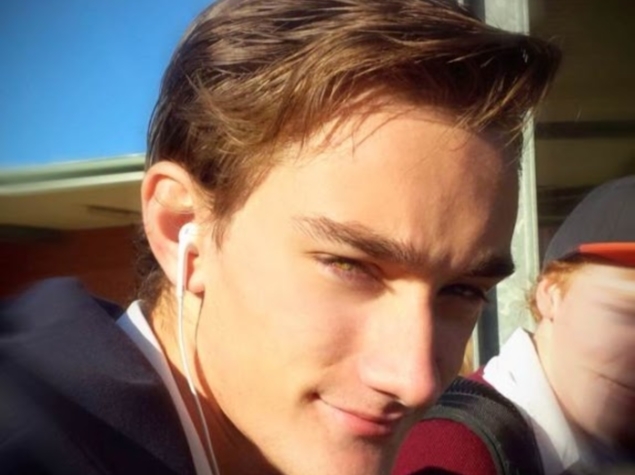 Sonny Dickson lives with his parents in suburban Melbourne. He snatched attention in August after he released detailed pictures and videos of the new grey and champagne casing on the upcoming iPhone. Earlier this Thrusday, Dickson leaked the first detailed pictures of the new model’s new “home” button with its rumored biometric fingerprint scanner. Apple who has been passionately controlling information of its new product launches has invited media to an event on September 10 is expected to unveil at least one new model from iPhone. According to a source in June, Apple is expected to launch two new models this year. They will have the fingerprint technology and a cheaper version in a plastic casing and will be named iPhone 5S and iPhone 5C respectively. Apple seems to plan the 5C model in a range of five or six colors to differentiate it from the expensive model that only used to come in black and white. However, Apple declined to comment on Dickson’s actions and he says they have never contacted him about it either. Dickson reveals Reuters that he has around five to ten sources in China who buy Apple prototype parts directly from factory-line workers and then sell in ranges of $250 to $500. His sources send him photos and videos of the parts, which are posted under his name on his website and YouTube channel, a way by which he generates ad revenue. While communicating via Weibo, a Chinese microblogging service, Dickson said he and his suppliers moved to a secret website to discuss business. He spends around 12 hours a day looking after his website and blog views which spiked to a million hits last month, making him a $2,000 from web traffic in August. Dickson says,” “Most of the traffic is from the U.S. – I’ve had 590 hits from Apple and about 53 from U.S. Homeland Security in August.” He tracks IP addresses from Washington D.C. and Apple’s headquarters in Cupertino, California. But he denies that he is breaking any laws. However, experts are not so sure. “He may not think or know he’s doing the wrong thing, but a court would say Apple is one of the most tight and restricted IT producers in the world, notorious for locking things down,” said David Vaile, executive director at the Cyberspace Law and Policy Centre at the University of New South Wales in Sydney. “It’s also possible that generating ad revenue will open him to a wider range of offences,” David further adds. Dickson is of the opinion that he would stop if told to by Apple. He is not doing any of it to piss them off. He still buys their product. He also dreams of working with Apple some day. Next story How should Bloggers and Businesses utilize Google+ as Social Media tool effectively?